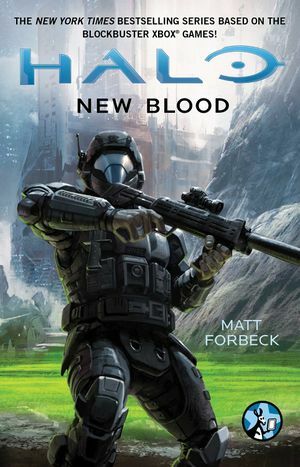 Halo: New Blood is a Halo short novel written by Matt Forbeck. It was released digitally on March 2, 2015, with a paper version released on March 15, 2016. The print release of Halo: New Blood included an additional five-page coda, featuring a conversation between Veronica Dare and Edward Buck shortly before the events of Halo 5: Guardians. The book explores Edward Buck's actions after the end of the Human-Covenant War. A sequel by Matt Forbeck titled Halo: Bad Blood was released on June 26, 2018. It follows Buck and the rest of the squad immediately after the plot of Halo 5: Guardians. “ While Spartans get all the glory, no soldier―not even the legendary Master Chief―wins a war on his or her own. Gunnery Sergeant Edward Buck and his team of Orbital Drop Shock Troopers played a major role in saving the Earth from all-out invasion at the end of the Covenant War―acts of bravery and ingenuity that did not go unnoticed by the United Nations Space Command. 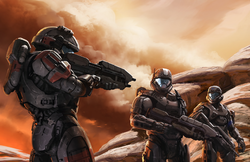 Now, after many Spartans have been killed in battle and the Master Chief is listed as MIA, the UNSC decides to create a new generation of Spartans to defend humanity from threats both outside―and within. When they come to Buck with an extraordinary proposition, he is forced to make a life-altering decision. With the Covenant War finally over, is it time for him to finally retire to the sidelines for a life he could only dream about... or is he prepared to step up and become part of the military’s new blood? In a report for the Office of Naval Intelligence, Edward Buck reflects on his military career, the SPARTAN programs, and the Human-Covenant War. He notes that although humanity defeated the Covenant, some remnant factions continue to battle the UNSC and the Insurrection continues. Buck mentions that he was just deployed to Talitsa, a world controlled by the United Rebel Front, to rescue the captured Huragok Quick to Adjust and his handler, Sadie Endesha. Sent by ONI Captain Veronica Dare, SPARTAN-IVs Buck, Kojo "Romeo" Agu, and Michael "Mickey" Crespo approach a URF military base and spot Quick to Adjust nearby. Suddenly, Buck feels a rifle pressed against the back of his helmet. As his squadmates warn him not to move, dozens of insurgents surround them. Buck recalls a previous hostage situation on his homeworld Draco III in 2554. He reminisces about his childhood on the planet, fishing in the Gold Sea, and joining the UNSC Marine Corps after the Covenant attacked Harvest. After the Covenant invaded Draco III and massacred its residents, Buck joined the Orbital Drop Shock Troopers. After the Covenant War, Draco III was resettled and its capital city of New Albany was largely restored. However, the United Rebel Front attempted to take control of the planet and established a headquarters in New Albany's capitol building. Following the orders of Dare, Buck and his ODST fireteam Alpha-Nine attempt to assassinate Captain Ingridson, the URF leader on the planet. The squad storms the capitol building, but they are ambushed by URF soldiers and the Rookie is held hostage at gunpoint by Ingridson. As a stand-off ensues between them, Spartan Sarah Palmer contacts Buck and asks if he requires her assistance. Buck remembers his last encounter with Palmer, when she was a lance corporal and a fellow ODST. During the Battle of Sargasso in 2546, Alpha-Nine and Palmer's squad, Gamma-Six, were both assigned to protect Lethbridge Industrial facilities at the town of Belisk. While ONI had Gamma-Six unknowingly serve as a distraction, Alpha-Nine—then composed of Buck, Gomez, Svensdottir, and Samrat—was tasked with retrieving a valuable ONI chip containing data and research located in Lethbridge's headquarters in the town. Captain Dare coordinates the mission, and Buck vocally voices his disapproval of the operation. Buck reminisces about the first time he met Veronica Dare in 2545, after he was ordered to take shore leave when Draco III was attacked. Meeting at Castellaneta, a resort orbiting Saturn, the two spent the week together, until Dare revealed that she was an ONI operative and the two parted on rough terms. Back at Sargasso, Buck and his squad reluctantly agree to carry out Dare's mission. After Alpha-Nine eliminates the scattered Sangheili, Jiralhanae, and Unggoy soldiers at the Lethbridge headquarters, Buck retrieves the data chip and the squad prepares to leave the town in a civilian truck. While en route back to base, Buck intercepts a transmission from Palmer to Command requesting extraction. When Command is unable to extract Palmer and her squad due to the overwhelming amount of hostiles at her position, Buck disobeys Dare's orders and leads his squad on a mission to rescue Palmer and her squad. By the time Alpha-Nine arrives at Palmer's location, the rest of her squad has been killed. Together, the five ODSTs eliminate the Jiralhanae, Kig-Yar, Unggoy, and Banshees in the area and return back to base in the truck. For disobeying her orders, Dare threatens to charge him with insubordination and warns him to trust her in the future. The two avoided each other for a majority of the war's remainder. Buck jumps to his first encounter with the SPARTAN-IV program in 2553. While on vacation on Sundown with Dare, former SPARTAN-III Jun-A266 meets with Buck and offers him a position in the first class of SPARTAN-IVs. Much to Jun's surprise, Buck declines as he feels that he would be abandoning his teammates and Dare. Buck then recalls the events that his squad was involved with during the Battle of New Mombasa in 2552. Alpha-Nine, now consisting of Buck, Romeo, Mickey, Taylor "Dutch" Miles, and the Rookie worked with Captain Dare and ultimately rescued Quick to Adjust. After the squad finally regrouped, they traveled to an ONI orbital facility over Earth to interrogate the Huragok. When Quick to Adjust began to give information on what the Covenant was looking for at Voi, Alpha-Nine returned to the field. Dare and Buck develop their relationship, and the two begin to trust each other. Back in the capitol building of Draco III, Buck signals for Mickey and Dutch to sneak up to the floor where Ingridson and the rebels are holding the Rookie hostage, while he and Romeo distract her. Buck declines Palmer's help, as he believes the arrival of Spartans would lead to the Rookie's death. While Buck and Ingridson debate their respective views, Dutch and Mickey get themselves into position. On Buck's orders, Mickey and Dutch attack Ingridson and her rebels, while Buck asks for Palmer and her Spartans to eliminate the rebels approaching their position. When Mickey, hesitant to kill humans, orders Ingridson and the rebels to stand down, Ingridson desperately executes the Rookie, to the shock of the rest of the squad. Dutch kills one of the rebels and Ingridson with his shotgun, while the other insurgent surrenders. Mickey contemplates executing the rebel, but Buck orders him to stand down. Having wiped out the rebels throughout the city, Palmer and her Spartans rendezvous with the remainder of Alpha-Nine in the capitol building. The ODSTs have a funeral for the Rookie and bury him at sea on Draco III. During the funeral, Dutch announces his decision to retire from service with the UNSC military. Buck leaves for his hometown of Karnak and starts drinking at Leeward's. He is met by Jun, who offers him, and the remainder of his squad, positions in the second class of the SPARTAN-IV program. After consulting with Dare about the offer on Desdoron V, Buck accepts and travels to Mars for training. After receiving his augmentations, Dare informs Buck that a Spartan within Buck's class is affiliated with the URF. Buck continues training on a space station under the command of Captain Marisa O'Day, who intends to break the Spartans of their old habits. After a training session, Buck witnesses the corpse of a fellow Spartan being towed away by medics. Buck, Romeo, and Mickey are later consulted by Jun and Musa-096‎ in their quarters; Jun had discovered a medallion belonging to Mickey on the corpse of the dead Spartan. Mickey and his friends insist that he is not responsible for the murder, and Jun and Musa decide to review security footage to see if someone had stolen the medallion from Mickey's locker. Security footage soon proves that Spartan Rudolf Schein was responsible for the murder, and Jun, Musa, and O'Day confront him in the station's rec room. However, Schein attempts to blow up the station and only succeeds in breaking the rec room's viewport and unintentionally ejecting himself and Jun outside of the station. Meanwhile, Buck, Romeo, and Mickey rush to the site of the conflict, only to witness O'Day being caught in an explosion. The three Spartans attempt to take the wounded captain to safety, but she is killed when she impacts against a wall at a high speed. The Spartans take shelter in an empty room, while Jun manages to propel himself back to safety by kicking off of Schein's body; Schein dies in the vacuum of space. While Jun receives medical attention, Musa speaks with the Spartans about the incident and reminds them that it is necessary to defend the UEG against all threats, even humans. Mickey betrays Buck and Agu on Talitsa. Buck returns to the mission on Talitsa. It is revealed that Mickey had betrayed the squad and affiliated himself with the URF after attending Schein's funeral and meeting his father. Having become disillusioned with the UNSC due to him becoming required to kill fellow humans, as well as feeling responsible for the Rookie's death, Mickey joined the URF and worked with Doctor Schein to capture his teammates. Buck is enraged at Mickey's betrayal, and him and Romeo are led to the URF base by Mickey, Schein, and the dozens of rebels. While en route, Romeo begins to insult Mickey and Schein. Mickey accidentally pushes Romeo down a hill in response, and the rebel soldiers give chase. Buck uses the opportunity to attack Mickey and the two former friends begin to brawl away from Schein, the rebels, and Romeo. Romeo soon learns of Buck's situation and begins to massacre the rebels using rocks and their own weapons. After knocking Mickey unconscious, Buck is wounded and held at gunpoint by Schein. While the rebel doctor attempts to use him to force Romeo to surrender, Buck takes off his helmet and throws it at Schein, knocking him to the ground. Buck smashes the rebel's helmet in, killing him. While Romeo heads off to retrieve Sadie and Quick to Adjust, Buck awaits for Mickey to awake. When the turncoat Spartan regains consciousness, he begs for Buck to kill him. Buck refuses and the two sit together in silence as they wait for their dropship to pick them up. The Spartans return to Mars, where Mickey is put into custody by the Spartan branch instead of ONI at Buck's insistence. Afterwards, Buck is congratulated by Musa for his actions on Talitsa. At Buck's request, Musa reassigns Romeo and Buck to another team, with Buck serving as a member of the team rather than as its leader. After reporting to Jun, Buck then decides to rest and contact Veronica. New Blood is the first official work to feature at least one member from every generation of the SPARTAN programs. The book's final line, "'Bam', said the lady," is a personal catchprase of Buck's voice actor, Nathan Fillion. Buck says it on occasion in Halo 3: ODST. On several occasions Buck refers to the Covenant as "Bugs", likely in reference to the alien race of the same name in the novel Starship Troopers and its various adaptations. Notably, many aspects of the ODSTs were heavily influenced by the Terran Mobile Infantry as portrayed in the original Starship Troopers novel.